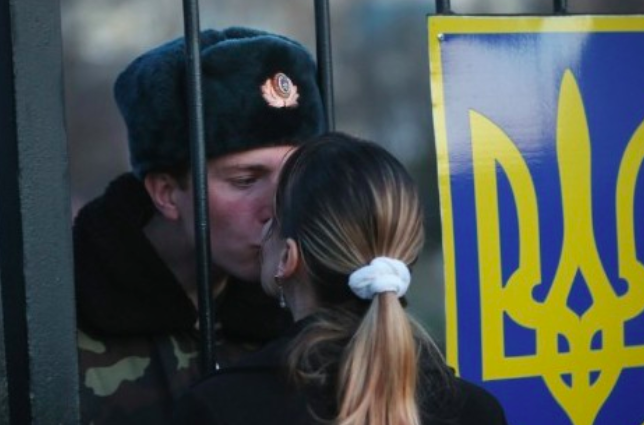 Europe wants out from the costly sanctions — to get them lifted, go to Kiev! In plain view of the economic consequences , Europe wants the Russian embargo lifted. This embargo is a response to the European sanctions against Russia. Europe demands the full implementation of the Minsk agreements to lift its sanctions — and calls on Moscow to put pressure on the Ukrainian authorities even though they are in a compete russophic hysteria. On 17 February, at the joint press conference with Hungarian Prime Minister Vladimir Putin stated the Russian position. Linking the lifting of sanctions against Russia with the implementation of the Minsk accords is useless. This is because Ukraine is not fulfilling its agreements…« We have heard and we are hearing today that it depends on the implementation of the Minsk accords between the parties of the Ukrainian conflict, which was supported in the Normandy format by Russia, France, and Germany. But now it seems to me that every objective observer sees today that the ball is in Ukraine’s court. First of all, they must fulfill the conditions of the Minsk accords. I remind you that the essential lies in a political solution, by the creation of political conditions, mainly introducing amendments to the Constitution of Ukraine, which is clearly written in theMinsk accords. These accords specify that before the end of 2015, Ukraine must make these adjustments to its constitution. As we can see, this has not happened. Europe has become the prisoner of the internal problems and power struggles that were set in motion by the coup d’etat in Ukraine. Even though they signed the accords, Ukraine is not making the constitutional reforms that are supposed to permit a political solution in the Donbass. The meeting of the Normandy format foreign ministers of the March 3, in Paris, was doomed to failure. Ukraine is seeking to modify the accords that it signed; Russia insists that the accords be applied whole. France, faithful to its diplomatic waverings, says the same thing, yet organizes a meeting to thus open the door to eventual renegotiations. It is clear that Ukraine — able go back on its signature and hold out against three European powers, even when quasi-bankrupt — has powerful support — no doubt that same support that sponsored the coup d’etat of February 2014 in Kiev. The French authorities are at a crossroads. Either they exercise their authority, and that of their European partners vis-à-vis Ukraine, or they continue to debase themselves by supporting underhand Atlanticist interests, at the expense of our own industries, most notably the agricultural ones. Messieurs Macron, Valls, Le Foll and Ayrault will waste their time organizing meetings, or traveling to Moscow to meet Russian leaders. If they want to help the French economy and the interests of France, their destination should be Kiev, to demand the implementation of the agreements.